I have always wondered what makes the universe exist. Time and space may forever be a mystery, but that has not stopped my pursuit. Our connections to one another have grown infinitely and now that I have the chance, I’m eager to share this journey with you. Be curious, I know I will forever be. Join his official Facebook page here. And find/like the official Open Culture page here, where we make it easy to share our daily cultural posts with your family and friends. 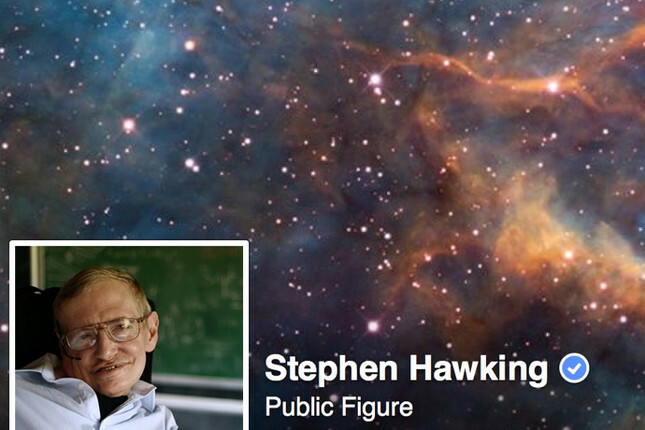 Looking foward to mr. Hawking’s comments…..
Stephan Hawkins is cool. I would like to see these programs. Physics is cool also. I am 75, but never tire of learning and hearing theorys. I would like to see and read these topics. One question for Mr. Hawking: what does he think of the idea that the universe is a computer simulation? Interested in learning more about the universe. Please keep me in mind. Mr. Hawking, I am very much into physics, I am 43 years old and have a 4yr old son, what would be the best way to get him interested in the a) the solar system b) the galaxy, c) the universe, d)????. sir , splitting of 1 molecule into different forms and due to some kind of hits and cracks make this ..
we have a many problem either than universe such as poverty,unequality and destruction on earth by human sillyness and we wastage our money to searching the other planet. always ready to learn something new,bring it on. It is very inspiring for us to see you remaining so active in your scientific pursuits in spite of your physical problem. As a firm Believer, I pray to God with all my heart to cure you of this serious disease. I am sanguine that your remaining healthy and fit will benefit humanity as whole which is heading toward the danger of extinction due to various factors. Personally, I would like to know your opinion about God whether you believe in Him and Is He the Cause for everything happening in the universe? Kindly find some moments to post your brief answers. I am very happy to be live at the same time in which YOU live .In the middel east millions of peaple can not breath freely and securly because of radical followes of god.Please motivate same other scientists to discuss،speak، write and publish more openly and bravely az YOU. Thank You very much ، because YOU opened our closed eyes. I am a children educational books writer and publisher from Myanmar. This website will be a great help to me. We (Buddhist people) do not believe in God but happy with believing that we are always with our deeds, and we meditate when we want to get out of time and place. However your scientific challenge to knowing about the universe gives us huge courage to learn ( I am not a scientist). So grateful to be in touch with you. why at the time of the formation of the first tiny particle of matter, called quarks or when the time when unimaginable amount of energy released have there is any force work on this…………. The great pyramid of giza to me has 2 actions within its silent language . Prophetic and the way it was built. If u will note the math etc. Was a way,if u will pardon this expression, of keeping their ducks in a row, as they altered certain unseen laws to accomplish their objective. With all do respect sir, wouldn’t that be the proper protocol for all scientific endeavors. Mr.hawking,one galaxy born from anather one mother galaxy i think much biger,much langer lighting years ,that away from all the galaxys .like yeast cell production.this all my imagenations. Sir I consider you as the incarnation of Indian saint of Hindu Mythology named as Astavakra Ji Maharaj.He has the greatest knowledge of formation of universe.As we know that initially the universe was a point composed of energy only.Let this energy be called cosmic energy.From this cosmic energy with the lapse of time anti matter came out leaving behind the matter.slowly and slowly matter came in contact with anti matter and thus complete annihilation took place.This complete annihilation gave result called The Big Bang.Sir do you agree or not , please do convey the other principle. Sir you are my hope of my puzzle which always haunting my mind.you are only my solution.As we know that energy is that very thing which has no mass and occupies no space.Let us consider a point in the space which has whole energy before Big Bang Explosion.Does it so please give your opinion. How a person goes to sleep? To my mind when selflessness prevails on the brain the man goes to sleep and dream creates a feeling of sadness or happiness which awakens the man.What is your opinion about it. To my mind eye acts as a camera which registers the activity which are guided by cerebrum and cerebellum and kept recorded in hypothalamus.As we know that cerebrum and cerebellum are active during day and hypothalamus is active in night.This means that dream is guided by hypothalamus.What is your opinion about it. Sir I want to know how dream is related with the formation of universe because I consider dream as a antimatter. Best wishes to in your quest for life in outer space.